NES High Speed (USA) in 20:05.57 by dwangoAC. High Speed was released on the NES by Rare Inc. in 1991 and is based on a real pinball machine released by Williams pinball in 1985. 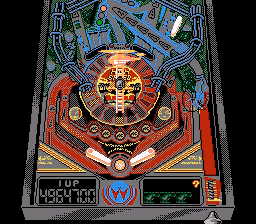 The core rules of High Speed were ported over fairly faithfully from the original pinball machine although Rare added in two different minigames and a "wizard mode" goal which is reached by completing a total of 8 cannon minigames and 6 race minigames. Completing all three races and all four cannon minigames causes a spaceship to appear which displays a message that states "you have beaten the system... for now”; beating another round of three races and four cannon minigames causes a rocket to appear which states “you have beaten the system this time.” and marks the end of the game. Reaching this final “you beat the system” bonus is the goal of this speedrun.